Craving a gourmet meal, but lack the money and energy to go out? This steak recipe is both affordable and low-maintance. What better way to treat yourself than with a perfectly tender piece of meat? 1. Pour 1 cup of water into a medium saucepan to boil and then add 1 cup of rice. Reduce heat, cover the pot and cook until rice is tender. Once rice is cooked, let steam for about ten minutes. In another smaller pot, place 2 potatoes in boiling water for about ten minutes, or the same time it takes you to cook the rice. 2. 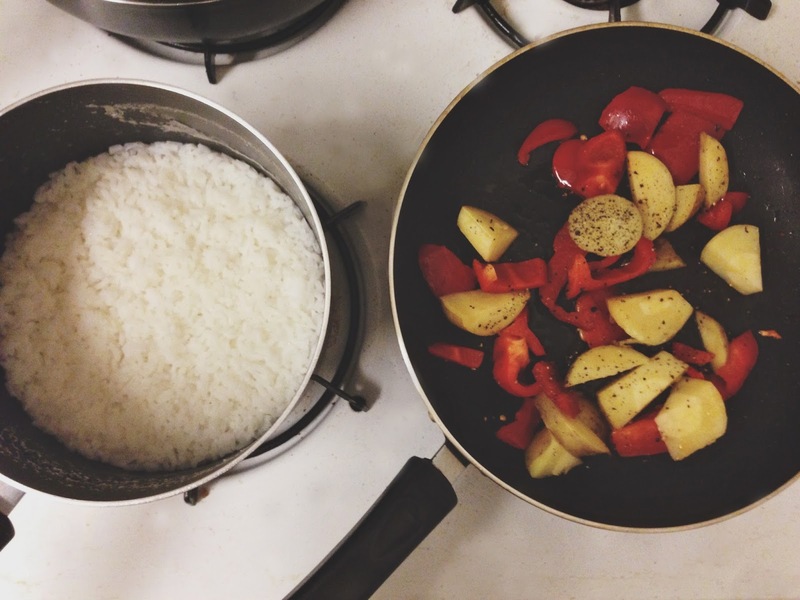 While you are cooking your rice and potatoes, heat the olive oil in a large pan over medium heat until oil simmers. Add your rib eye steak and cook for about three to four minutes on each side or until steak is medium rare. Season with salt and pepper. 3. Next, remove your steak from the pan and let it cool off on a separate plate. You will need to rinse your pan and reuse for cooking the vegetables. Once the pan is clean, heat olive oil over medium heat until oil simmers. Add the smashed garlic and stir for about one to two minutes. Then, add your chopped bell peppers and stir thoroughly. 4. Once the potatoes are done cooking, remove and place them on a cutting board. Peel your potatoes and chop them into small slices. Then, add your potato slices to the pan and continue to stir bell peppers and potato slices for about five minutes or until vegetables are softened. 5. Lastly, transfer vegetables and rice into serving bowls or plates alongside your steak. Serve warm. Optional: You can cut your steak into bite-size pieces before serving. You can also cook the steak for one to two minutes on either side, cut your steak into bite-size pieces and toss the pieces back into the pan for another two minutes until medium rare. Cutting the steak allows for easier handling and faster cooking.